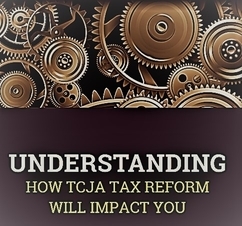 Regardless of your profession, age, or family status, if you have taxable income the Tax Cuts and Jobs Act (TCJA) will impact your bottom line. What changes will affect your bottom line? What changes will impact your business? Find out what you need to do when strategies you've implemented in that past are no longer applicable. Learn what decisions need to be made now in order to minimize future tax burdens & maximize the potential benefits.